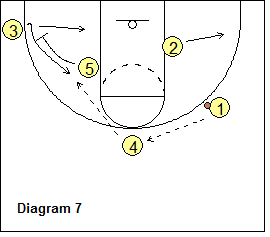 This article discusses basketball's "Hawk" offense and coach Lason Perkins' excellent DVD on former NBA coach and TV analyst Hubie Brown's Hawk offense. Coach Perkins at this writing resides in Cary, NC and coaches basketball at Cary Academy. Lason Perkins is recognized globally as one of basketball's brightest coaching minds. He has coached at every level of basketball from elementary school to the professional ranks, and is the creator of many instructional basketball videos. He is a great student of the game with an expert understanding of Xs and Os, and maintains contact with coaches from around the world. Coach Perkins has researched the Hawk offense in great detail and with this DVD, presents the basics of the offense, and then includes numerous detailed plays and options, all with on-court demonstrations. Plays are categorized as (1) plays for your shooters, (2) post plays, (3) pick and roll plays, and (4) isolation plays. The Hawk offense has been used by many NBA professional teams, a few college teams, but you don't see it much at the high school level (not sure why). Hubie Brown originated this offense when he was head coach of the Atlanta Hawks (hence the name "Hawk" offense), and other NBA coaches picked it up after that (Chuck Daly, Rudy Tomjanovich, Flip Saunders, Eric Musselman, Bob Ociepka). This is an excellent DVD and is a must for any coach wanting to use the Hawk offense. This is a well researched and well presented DVD of the Hawk offense. Also, as of this writing, I believe this is the only DVD available on the Hawk offense. Versatility - all 5 players are involved with this offense. Guard post options - you can post up a strong guard. You get good shots for your best shooters. Good opportunities to post up your "bigs". Good pick and roll options. 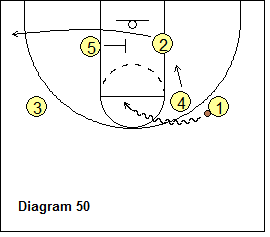 Hundreds of options and plays can be run from this set. See diagram 1. 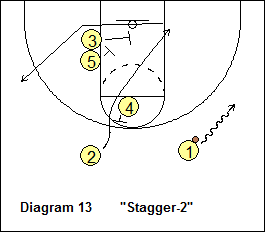 We start with a two-guard front, O4 at the high post, and O3 and O5 stacked low outside the left lane line. O1 dribbles to the right wing (diagram 2), as O4 back-screens for O2. O2 cuts around O4's back-screen to the ball-side right block, and could get the pass from O1 either on the cut, or after posting up above the right block. Note that O2 could cut either over or behind O4, depending on what the defense allows. Diagram 3... if the pass to O2 is not open, O2 moves out to the corner, and O1 passes out to O4 (who steps out to the top after the back-screen for O2). Meanwhile, O3 cuts around a screen from O5, and out to the left wing. O3 could get the pass here from O4. 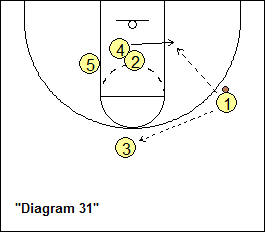 O3 could shoot the 3-point shot, or pass inside to O5 posting up (diagram 4). 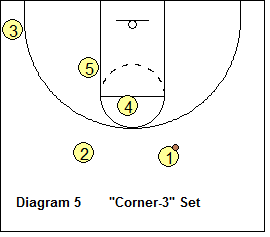 Diagram 5 shows the "Corner-3" set with O3 starting in the left corner, and O5 part way up the left lane line (for a better screening angle). The action starts just as the basic action above with the O1 dribble to the right wing, and the O2 cut around O4 (as in diagram 2). 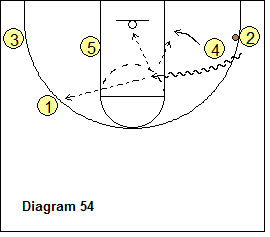 Here, on the reverse pass from O1 to O4, O5 down-screens for O3 (diagram 7) and O3 cuts around the screen. O3's cut could be either a straight cut underneath O5, or a curl cut, and O3 could get the pass inside from O4, and the inside shot. After screening, O5 pops out to the left wing and could get the pass from O4 (diagram 8). O5 could shoot the outside shot (if this is a good shot for him/her), or pass to O3 posting up. 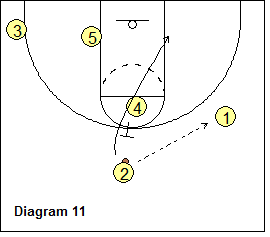 To start the offense, O2 has the ball and passes to O1 (diagram 9), and from here the basic Hawk action begins with O1 dribbling to the right wing and O2 cutting around O4's back-screen (as above). 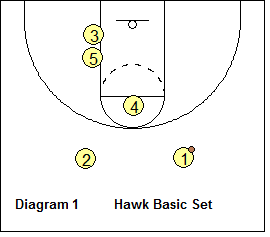 We can start the Hawk offense from a 1-4 set (diagram 10). O2 starts with the ball at the top. O3 cuts underneath to the left corner. O4 and O5 double-screen for O1, and O1 cuts to the right wing. O2 passes to O1 (diagram 11), and now we are in our familiar Hawk "Corner-3" set, with O4 back-screening for O2. If O2 is not open, O1 reverses the ball to O4 (diagram 12), just the same action as seen previously. Numerous set plays can be run from the Hawk offense. Coach Perkins presents a number of plays here. Put your best shooters in the O2 and O3 positions. This play gets a shot for your shooting guard O2. 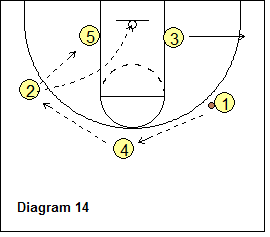 Diagram 13 shows the basic Hawk action with O1 dribbling to the wing and O2 cutting to the right block off O4's back-screen. O3 and O5 set a double-screen for O2, and O2 cuts out to the left wing. 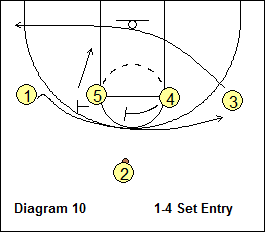 O1 reverses the ball to O4 (diagram 14), and then O4 passes to O2 for a 3-point shot. O2 could pass to O5 posting up. Notice after the screen for O2, O3 cuts out to the right corner. 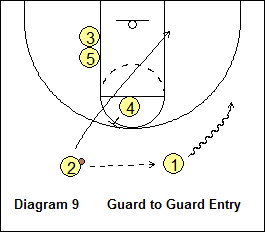 This play gets a shot for the point guard O1. Diagram 15 shows how our players are positioned after the basic Hawk action with O1 on the wing with the ball, O2 on the right block, and O4 on top. O1 passes out to O4. O1 cuts inside around a triple staggered screen to the left wing. O2 back-screens for O1, O3 sets the first inside screen and O5 has the last screen. 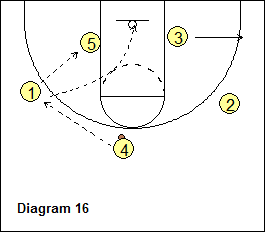 O1 gets the pass from O4 for the 3-point shot (diagram 16). O1 could also pass to O5 posting up. Get the rest of the Hawk Offense "Plays for Your Shooters" in Coach Perkins' Hawk Offense DVD, the Premium Members section and the Playbook download. When running this next group of plays, we are looking for our post players as the first option. With this play, Flip Saunders (Pistons), was looking to get Rasheed Wallace open for an inside shot. Diagram 30 shows our player positions after the initial Hawk action (O1 on the right wing and O2 on the block). 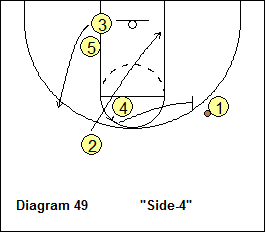 Instead of stepping out to the top, O4 down-screens for O3. O3 cuts to the top and could get the reverse pass from O1. O2 screens for O4 (diagram 31) and O4 cuts to the block for the pass inside from O1 (primary option). If O4 is not open, O1 passes to O3. 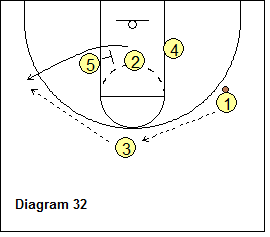 O5 screens for O2 and O2 cuts out to the left wing for a pass from O3 and a shot. After screening, O5 posts up on the left block and could get the pass from O2. 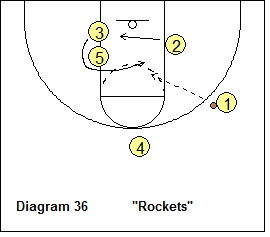 Rudy Tomjanovich ran this play with the Rockets. Diagram 36 shows our player positioning after the initial Hawk action (O1 on the right wing with the ball and O2 on the block, O4 on the top). 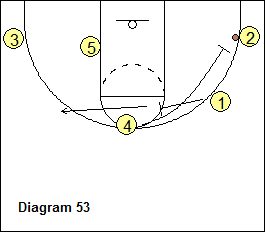 This play features two cutters around O5's screen. First, O3 curl cuts around O5 (diagram 36) to the right block, and could get the pass from O1 for a shot inside. O2 cuts around O5 to the left wing (diagram 37), as the ball is reversed from O1 to O4. O4 looks to pass "hi-lo" to O5 shaping up inside (diagram 38). 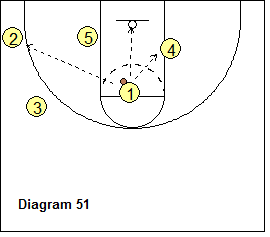 If O5 is not open, O4 takes a couple dribbles to the left and passes to O2. 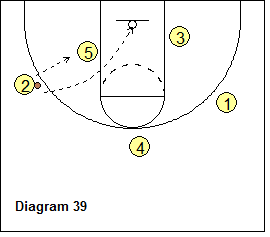 O2 could shoot (diagram 39), or pass to O5 posting up inside. Get the rest of the Hawk Offense "Post Plays" in Coach Perkins' Hawk Offense DVD, the Premium Members section and the Playbook download. 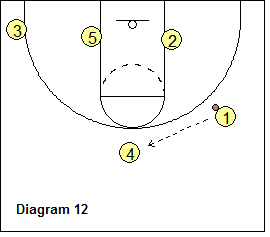 The ball-screen (pick and roll) can easily be included in the Hawk offense. 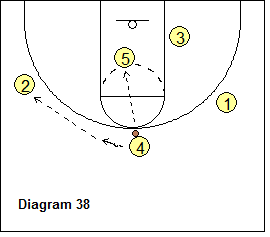 Here are several ball-screen plays. When running the pick and roll, the player with the ball should always take two dribbles over the ball-screen and then read the defense (shoot, attack with the dribble, or pass to the screener rolling inside). Screeners can either roll to the hoop, or pop out to the arc (good option for a good shooter). Diagram 49 shows the usual Hawk action with O1 on the right wing, O2 at the block (after his cut through) and O4 up top. O3 cuts around O5 to the left wing. O5 cross-screens for O2, who clears to the left corner (diagram 50). 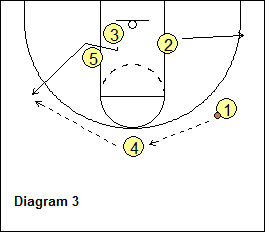 Now we run the pick and roll with O4 ball-screening for O1. 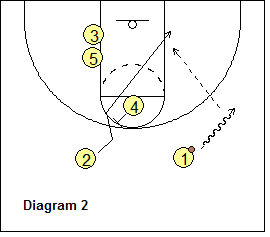 O1 can dribble-drive, shoot, or pass to either O2 in the left corner, or to O4 rolling inside. We start in the familiar Hawk action, but this time O2 cuts through to the block and then out to the right corner (diagram 52). O3 cuts to the left corner. O1 passes to O2. O1 screens for O4 (diagram 53), and O1 moves to the left wing. 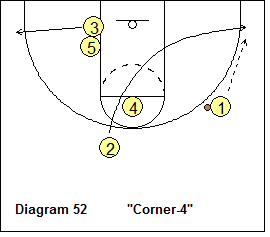 O4 ball-screens for O2 in the corner. 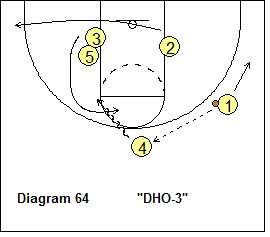 O2 and O4 run the pick and roll (diagram 54). 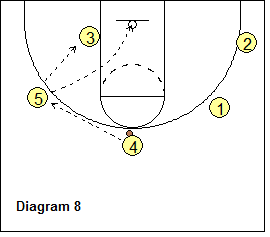 O2 can dribble-drive inside for a lay-up or shot, or pass to either O4 on the roll, or to O1 on the left wing. O5 could come open too if the X5 defender slides over to help. 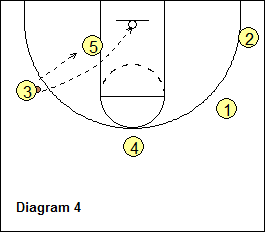 Get the rest of the Hawk Offense "Pick and Roll Plays" in Coach Perkins' Hawk Offense DVD, the Premium Members section and the Playbook download. 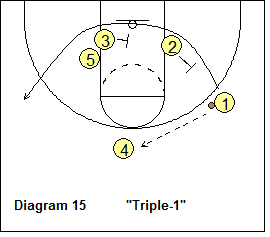 An isolation play allows (1) a talented offensive player to take his defender 1-on-1, and (2) also allows the offense to take advantage of a defensive player who is in foul trouble. 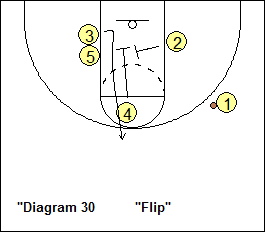 Here are several "iso" plays. Diagram 64 shows the usual Hawk action with O1 on the right wing, O2 at the block (after his cut through) and O4 up top. O2 cuts to the left corner. O1 passes to O4. O5 screens for O3. 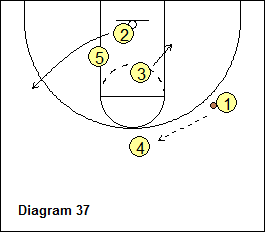 O4 takes a couple dribbles in toward the left, as O3 comes around O5's screen, and then around O4 for the dribble hand-off. 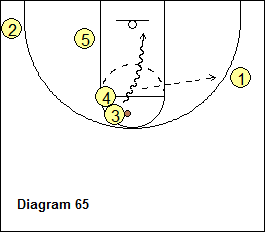 O3 tries to turn the corner and dribble-drive to the hoop (diagram 65), and also looks for the kick-out pass to O1 for a shot. Get the rest of the Hawk Offense "Isolation Plays" in Coach Perkins' Hawk Offense DVD, the Premium Members section and the Playbook download. 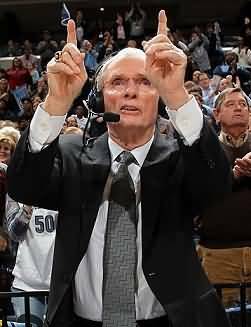 In summary, as you can see, Hubie Brown's Hawk offense, is based on a fairly simple, straight-forward set and action, but affords many available options and plays.